The Treats Truck opened in June 2007 and retired in December, 2016! You can still email us with questions, stories, requests for tee shirts, recipe questions, notes for Kim, at thetreatstruck@gmail.com or info@treatstruck.com!!! The Treats Truck will have its last day of regular spots on October 26th, 2016. Our truck and shop will continue catering private events, and delivering boxes of treats and cakes through December 23rd, and then we are closing The Treats Truck. I want to thank all of our customers for making these 9 1/2 years so special. The Treats Truck's first day on the streets of NYC was June 9th, 2007! It has been such a privilege and an absolute pleasure to serve you. As a small business owner in NYC, I have experienced daily such incredible support and good cheer from you all. I know my business was only made possible because of the incredible patronage and encouragement from local customers and well-wishers from afar. Thank you so much to you all. I'm often asked what is the best part of running the Treats Truck, and my answer has always been clear and true- the customers and the people of NYC - the doormen, bus drivers, mail carriers, dog walkers, police, tourists, our regulars, the school kids, and fellow vendors. A simple day is filled with so many moments we share together, along with just the right treat, of course! While our truck, Sugar, will retire, the Treats Truck story will continue through our website and future projects- so you can continue to write emails to me sharing your questions, stories, and photos of friends or family who used to come to the truck (kids all grown up!) or plates of freshly baked creations from your home kitchens. Our motto has always been "Treats are good". Being a part of NYC with my truck over the past ten years has been one of the biggest treats of my life. I love baking – for the truck, for the shop, for my friends and family. And I love when people bake for me! My mom still bakes for my birthday, and sometimes customers bring me treats they’ve made at home. Whether on your own, with a friend or with kids by your side, there’s nothing like a few hours in the kitchen baking – and then sharing - a freshly baked cake or plate of cookies. Writing a cookbook was a dream come true and so much fun. There are photos of our truck, our customers, and lots of easy to follow recipes. 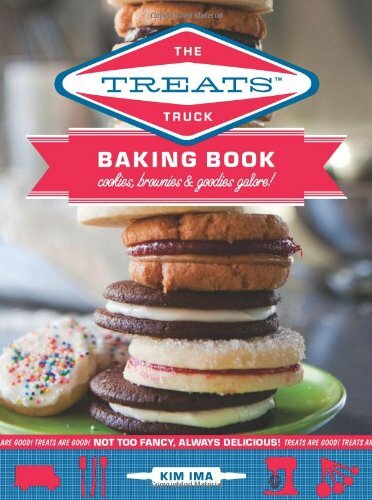 You can buy The Treats Truck Baking Book at our shop, at bookstores or on Amazon. Want to see? Go to our Harper Collins page for info! And thank you to everyone who has bought the book! I’ve loved all the emails, notes and chats about it at the truck and shop. © Copyright The Treats Truck 2015. All Rights Reserved.